“We embrace the North Park!” Pan Trinbago president Beverly Ramsey-Moore declared yesterday as she addressed the launch of Panorama 2019 at BP Renegades Pan Theatre, Charlotte Street, Port of Spain. “And we want to assure the posses that your space is secured in the North Park.” Peters announced the decision to abolish the North Stand, several weeks ago, saying it was not profitable and had become “an albatross” at the Queen’s Park Savannah (QPS), Port of Spain. The NCC chairman said the facility would fall within the framework of a reconfigured QPS in an area which will be referred to as Carnival City. Peters had said the North Park will include a picnic area and seating accomodation for patrons. The decision to abolish the North Stand was met with scepticism from several stakeholder organisations, including Pan Trinbago. But yesterday, Ramsey-Moore appeared willing to give the concept of the North Park a chance, saying on February 17, the organisation would host its Savannah Party in the venue. “And, we expect that all will go well. Despite the challenges, we will be jammin still, jammin in the North Park.” Urging supporters to come out in their numbers, Ramsey-Moore stressed this year there will be no freeness in pan. She said the organisation was seeking to rebuild its image and, as such, needed the financial support of pan lovers and corporate bodies. She said they were assured the North Park will accommodate in excess of 8,000 people. Ramsey-Moore also said some 163 bands will be participating in this year’s competition. She said the event will be dedicated to the country’s fallen cultural icons, including ace arranger Ken “Professor” Philmore, pan icon Ellie Mannette and veteran calypsonians Winston Bailey (Shadow) and De Original De Fosto Himself (Winston Scarborough). 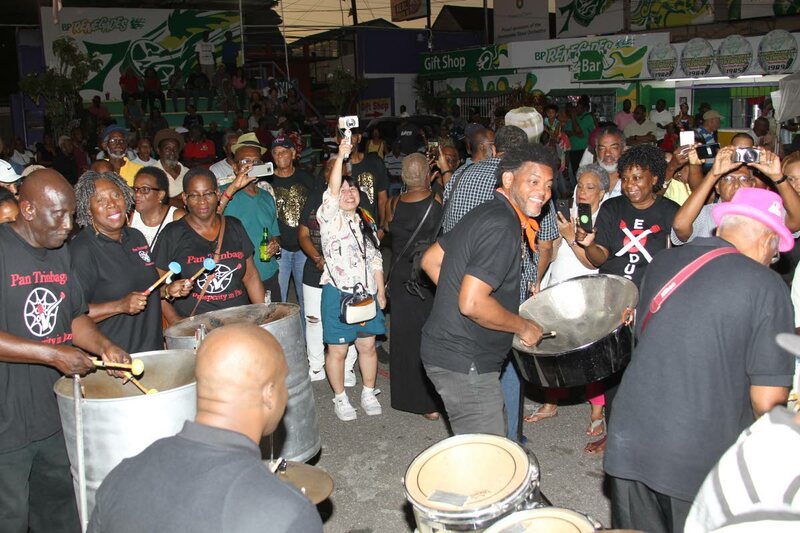 After the formal part of the launch, Ramsey-Moore and her team entertained supporters on the pan as members of Pan Trinbago’s newly-formed executive steelband. Ramsey-Moore, manager of the Tobago band Katzenjammers Steel Orchestra, made her official debut on the base pan. The band played several tunes, including Swappi and Ultimate Rejects Party Start, Nadia Batson’s So Long and Farmer Nappy’s (Darryl Henry) Hookin Meh, to the delight of the audience. Reply to "Jammin’ still in North Park"